Alessandro Marchi ™ is the trademark of my company because my Rigid Inflatable Boats are the means to realize myself in life. I was born in Milan in 1976 where since ever I have been playing and growing up with RIBs. I spent the first 20 years of my life enjoying the Italian booming lifestyle made of exciting excursions with the RIB belonging to my passionate father. I treasure in my mind and in my heart each minute of the time I enjoyed with my family on the water. On the lake or on the sea the memories are joy and smiles. Staying together on board celebrates the family as the best invincible team! I devoted my entire career to the RIBs industry. At the beginning I made up my experiences by working in every division of various shipyards in my hometown. When I realized that with my technique I could realize my dreams, I decided to shape my own RIBs: the boats carrying my name are made to reproduce the amazing experiences I used to have with my family on board. 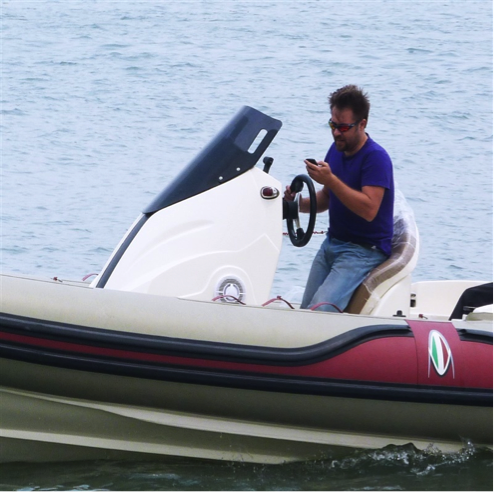 Nowadays Alessandro Marchi ™ is the rising star in the boating industry. Thanks to the dedication of my partners and of all the team contributing to our project, we are sharing our passion by delivering our RIBs around the world.